Has it been awhile since your last exhaust system cleaning? You could have a fire code violation on your hands. Plus, you may be putting your restaurant at risk of serious damage from a grease fire. At Flue Steam, we have decades of experience in the specialized field of commercial kitchen exhaust cleaning. We know what NFPA code inspectors are looking for and we know how to make them happy. 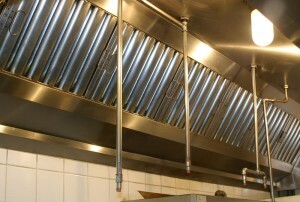 All you have to do is call us now for expert restaurant kitchen exhaust cleaning in Beverly Hills CA. Because different parts of the exhaust system accumulate grease at different rates, we offer two different types of restaurant kitchen exhaust cleaning in Beverly Hills CA. Hand scraping is an affordable way to remove greasy buildup from the areas where it accumulates the fastest, namely your exhaust hoods. This service is usually needed about once per month. Steam cleaning is a more thorough process that uses hot water to remove grease from the entire exhaust duct system. Most restaurants need this service 2 to 4 times per year. With help from Flue Steam, you don’t have to rely on guesswork to determine when you should get these services. We can measure your grease deposits to determine the rate of grease accumulation and then recommend a cleaning schedule that will let you get the cleaning you need just before the grease begins presenting a danger. As a convenience for our clients, we always provide Certificate Performance stickers after every cleaning. These stickers include the date of service to help you keep track of your cleaning schedule, and to confirm to code inspectors that your kitchen is in compliance. Grease filter exchange service: Reduce the rate of grease buildup in your ductwork by letting us bring you clean grease filters periodically. Exhaust fan inspection: As a courtesy to our clients, we always inspect the exhaust fan when providing restaurant kitchen exhaust cleaning in Beverly Hills CA. We grease the fan bearings and we can even replace the fan belt if you have spares on hand. Swamp cooler service: Make your life easier by scheduling your semi-annual steam cleaning and your bi-annual swamp cooler service on the same day. Fire extinguisher service: NFPA codes are very specific about the types and locations of fire extinguishers in your restaurant kitchen. We can provide quality equipment and recharge fire extinguishers as needed. Whether it’s time for a routine cleaning or you need an emergency restaurant kitchen exhaust cleaning in Beverly Hills CA, you can count on Flue Steam. We can have a crew at your restaurant ASAP. Please call 800-700-FLUE now to schedule service.